It may be clear by now that I have bitten myself into the issue of the “legal opinion” of EURALIUS, sent on November 13, 2017 to Parliamentary Legal Affairs Committee Chair Ulsi Manja. The legal opinion, which was the only legal opinion that EURALIUS has drafted during its entire mission from 2014 to 2017, provided Rama government with a much-needed argument to unconstitutionally elect a Temporary Prosecutor General, which since then has wreaked havoc at her institution. The problem resides precisely in the legality of this opinion, and the question whether EURALIUS actually had a mandate to issue it. EU-funded legal assistance missions have clearly defined mandates, in part to avoid the EU from interfering in local politics in a way that is dubious. If a member encounters a situation that is not covered by these SOPs, the member shall be expected to exercise sound judgment and act in accordance with the core values and objectives of the Project. 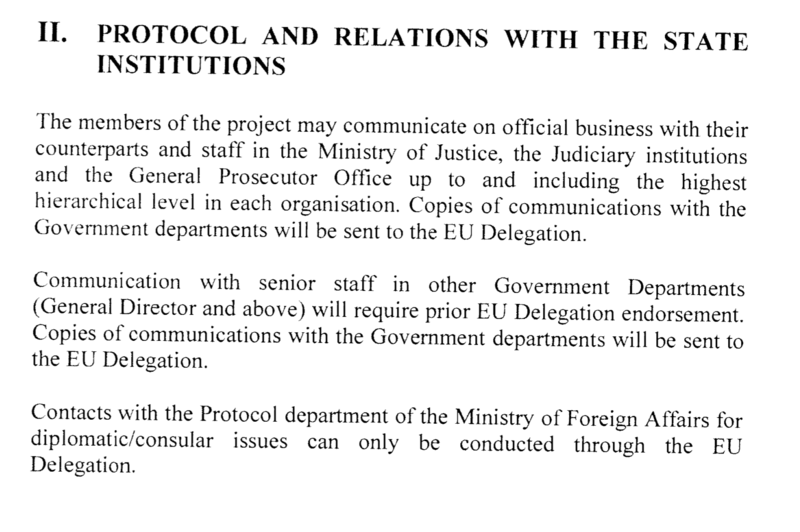 According to this SOP, EURALIUS members are free to communicate with the “Ministry of Justice, the Judiciary institutions and the General Prosecutor Office” without prior approval of the EU Delegation in Tirana. Communication with the government above the level of General Director requires EU Delegation endorsement, while diplomatic issues can only be conducted through the EU Delegation. However, the legal opinion of November 13, which had a considerable impact on the rule of law in Albania and caused a Constitutional crisis, was not addressed to the Ministry of Justice or any government department. It was addressed to a member of the Albanian parliament. As the EURALIUS mission is not expected to contact any member of parliament (MP), it should have been in accordance “with the core values and objectives of the Project” if Team Leader Bernhard had requested “prior EU Delegation endorsement” before sending the legal opinion to Parliament; this EU Delegation endorsement is already necessary for communication with General Directors at ministries, so it should have been within the spirit of the contract to communicate with the EU Delegation before sending off such a potentially controversial document to an MP of the ruling majority. EURALIUS IV delivers its services directly to the beneficiaries: the Albanian authorities. Their legal opinions are those of independent experts. They do not seek nor require the prior endorsement of the EU Delegation. As may be clear from the answer, the EU Delegation itself appears to be uninformed about the Standard Operating Procedures of the EURALIUS IV mission. These clearly mention that in the case EURALIUS is not communicating with its main partners in government – the Ministry of Justice, the courts and the Prosecution Office – prior endorsement is necessary. Therefore the claim that EURALIUS “do not seek nor require the prior endorsement of the EU Delegation” is false. The contract stipulates cases in which such endorsement is required, and there is good argument to make that the legal opinion issued to Ulsi Manja is one of them. Moreover, the answer shows that EURALIUS did not request prior endorsement of the EU Delegation for its legal opinion, in apparent violation of its own procedures laid down in its contract with the European Commission. This raises the following disturbing questions: in how many other cases did the EURALIUS mission violate its contract with the European Commission? And in how many other cases did the EU Delegation fail to exercise appropriate control over a project that cost millions of public money?